For the third time in a row, the consulting, engineering and testing company P3 communications and connect magazine have examined the Spanish mobile networks. As all of Spain’s four mobile operators have worked hard to improve regarding performance and coverage, the P3 connect Mobile Benchmark Spain promises interesting results. Which network is the best choice for voice and for data communications? And how does our new crowd­sourced operational excellence score affect the results? In the 2017 P3 connect Mobile Benchmark in Spain, Vodafone ranks first again. Movistar comes in as a strong second but Orange could reduce the gap, and Yoigo shows considerable improvements compared to last year’s results. Thanks to the carefully designed methodology, based on comprehensive drivetests and, for the first time, an additional crowdsourced assessment of data service availability (see page 8), P3‘s network benchmarks are highly objective, and have been widely accepted as authoritative. This year, the drive tests covered 17 of the largest cities in Spain, each with more than 100,000 inhabitants. Our measurement cars also visited smaller towns and drove on connecting roads and motorways. The areas in which we tested account for more than 11.5 million people, or almost 25 per cent of the Spanish population. P3‘s rigorous measurements included the use of up-to-date LTE Cat 9 as well as VoLTE-capable smartphones for the tests. Also, we constantly readjust the thresholds of our evaluation. 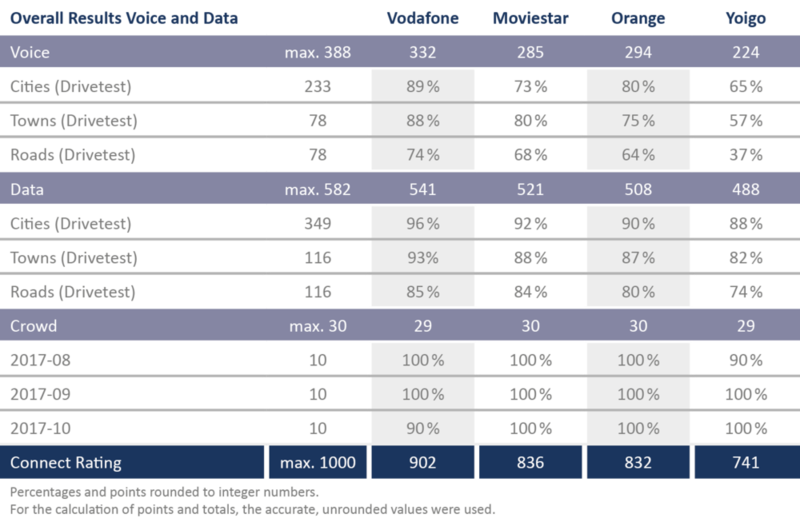 With steps like these, we reflect the latest technical developments in the mobile networks and once more emphasise the scope of our benchmarking: How do the mobile networks perform at the edge of what is technically feasible – and to what extent do customers benefit from these capabilities? In order to provide valid answers to these questions, we have used the most comprehensive mobile plans available from each operator. Almost all Spanish operators improved their performance levels in comparison to our 2016 mobile network benchmark. 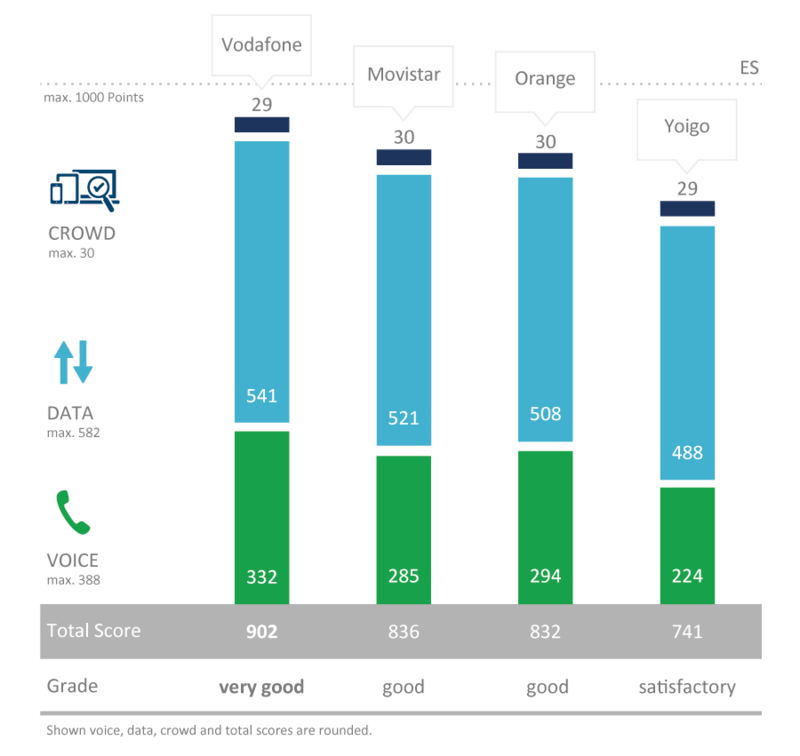 For the third time in a row, the overall winner is Vodafone with the grade “very good“, showing clear improvements in the data discipline and similar voice results as in 2016. A reduction in the total voice points can be explained with the addition of the crowd score resulting in adjustments in the maximum achievable points in the other disciplines. Movistar comes in second with the overall grade “good“. In comparison to 2016 and also to its competitors Vodafone and Orange, Movistar falls a little behind in the voice category, but can make up for this with strong data results. Orange still ranks third and achieves the grade “good“, as in 2016, but manages to reduce the gap to Movistar thus showing a clear overall improvement. The smallest Spanish operator Yoigo ranks last again, but achieves considerable improvements, particularly in the data category. This results in the rating “satisfactory“, which is a full grade above its last year‘s result. The Spanish mobile network market is highly competitive with the top three contenders permanently competing over market share. Also, all four Spanish operators have constantly increased their LTE coverage and speeds. Movistar is the brand name that the Spanish telecommunications company Telefónica uses for the mobile network in its home market. Telefónica S.A. itself is one of the largest telco companies in the world. The operator is present in 21 countries with a total of 127,000 employees and achieved worldwide revenues of over €52 billion in 2016. While the company introduced the Movistar brand in Latin American countries in 2005, it has been active in Spain since the launch of GSM services back in 1995. Today, Movistar is the largest mobile operator in Spain with about 15.3 million subscribers, which equals a market share of roughly 32 per cent. It offers GSM service at 900 and 1800 MHz, UMTS/3G at 900 and 2100 MHz and LTE at 800, 1800 and 2600 MHz. Since the end of 2014, Movistar has supported 4G+ carrier aggregation with maximum speeds of 150 Mbps. The operator claims to reach 89 per cent of the Spanish population with its 4G network. Vodafone España has been present on the Spanish mobile communications market since the year 2000. Then, the British Vodafone Group acquired Airtel Móviles which had operated in Spain since 1994. In Spain, Vodafone now reports 14.4 million mobile customers, adding up to a market share of about 30 per cent and making Vodafone the second largest operator in the country with a narrow lead over its competitor Orange. In the fiscal year 2016/ 2017, Vodafone Spain achieved revenues of €4.5 billion which contributes about nine per cent to the whole Vodafone Group‘s financial result. Vodafone‘s mobile network in Spain offers GSM service at 900 and 1800 MHz, UMTS/3G at 900 and 2100 MHz and LTE at 800, 1800, 2100 and 2600 MHz. The Vodafone 4G network in Spain supports LTE carrier aggregation (“4G+“) with maximum downlink speeds of 300 Mbps. Vodafone España claims to offer the best LTE coverage in Spain, reaching approximately 94 per cent of the Spanish population. Orange España is the brand name of France Telecom‘s mobile network in Spain. It has been operating under this name since 2006. Previously, the network was known as “Amena“ – this brand name lives on in Orange Spain‘s portfolio as a low-cost offer that is only available on the internet. Also, its network serves a number of mobile virtual network operators such as MasMovil, Carrefour Móvil and others. With 14.1 million customers, Orange is the third largest Spanish mobile operator with a market share of about 29 per cent. In the fiscal year 2016, Orange Spain achieved a revenue of €5 billion which contributed 12 per cent to the whole Orange Group‘s results. Orange Spain has deployed 2G networks at 900 and 1800 MHz, 3G networks at 900 and 2100 MHz and 4G at 800, 1800 and 2600 MHz. The operator claims that its 4G network reaches 93 per cent of the Spanish population. Also, Orange is the first Spanish operator to offer VoLTE to its 4G customers. Yoigo was the latest mobile operator to enter the Spanish market. Founded in the year 2000 under the name Xfera, the company started its actual operation in 2006, offering only a UMTS/3G network at 2100 MHz. At this time, the Swedish telecommunications company TeliaSonera acquired the majority of shares and rebranded the network as “Yoigo“. This name was supposed to reflect the simplicity and ease in rates as well as in the use of the service. In June 2016, the former MVNO (mobile virtual network operator) Másmóvil bought the company. Yoigo had a national roaming agreement with Movistar until the end of 2016. Since January 2017, Yoigo customers freely roam in the 2G and 3G networks of Orange at locations without Yoigo coverage. The current customer base of Yoigo is 4.2 million subscribers, which equals a market share of 9 per cent. Today, Yoigo operates 3G at 2100 MHz as well as 4G at 1800 MHz. The operator currently claims a LTE coverage of approximately 89 per cent of the Spanish population. In the past three years, Vodafone won, with Movistar and Orange constantly competing for the second rank, and Yoigo steadily working on improvements. How do the Spanish operators score in 2017? P3 communications GmbH, based in Aachen, Germany, is a world leader in mobile network testing. It is part of the P3 group, with over 3000 employees worldwide and a turnover of more than €300 million. P3 is partnering with the international telecommunications magazine connect, which has more than 20 years of editorial expertise and is one of the leading test ­authorities in Europe for telecommunications products and services. Together, P3 and connect have been conducting the most important network benchmark test in Germany for 15 years, extending it to Austria and Switzerland in 2009. Since 2014, the range of public benchmarks has continuously been expanded, today covering Spain, the Netherlands, Sweden, the UK and Australia. In 2016 alone, P3 compiled more than 60,000 measurement hours in 65 countries across five continents, with its test vehicles covering more than one million kilometres. As the de-facto industry standard, the P3 benchmarking methodology focuses on customer-perceived network quality – examining voice telephony that makes up 38.8 per cent of the result, data connectivity that contributes 58.2 per cent as well as operational excellence, currently accounting for three per cent of the total result. P3‘s network benchmarks are widely accepted as a completely objective authority. “All operators took the challenge of the P3 connect Mobile Benchmark and have increased their LTE coverage. In 2018, over the top content services, technologies like carrier aggregation and voice over LTE as well as crowdsourcing-based use cases will become more important. This will make the results even more exciting.